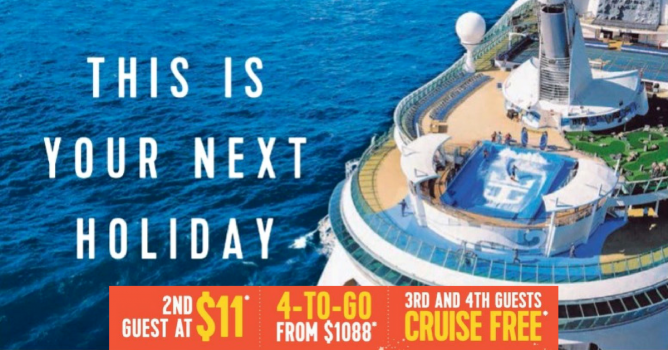 Home > Travel > Royal Caribbean: NATA Travel Fair 2018 Offers – 2nd Guest at $11, 4-to-Go from $1088 & 3rd and 4th Guests Cruise FREE! 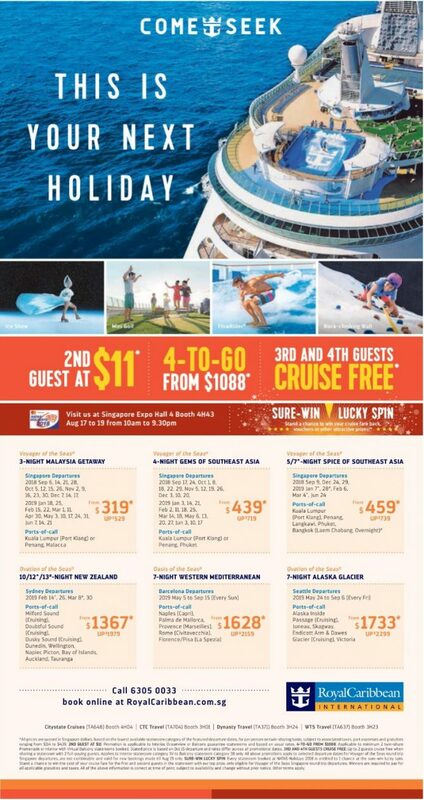 Promotion: Royal Caribbean NATA Travel Fair 2018 Offers - 2nd Guest at $11, 4-to-Go from $1088 & 3rd and 4th Guests Cruise FREE! All prices are quoted in Singapore dollars, based on the lowest available stateroom category of the featured departure dates, for per person on twin-sharing basis, subject to associated taxes, port expenses and gratuities ranging from $114 to $439. 2nd Guest at $11: Promotion is applicable to Interior Oceanview or Balcony guarantee staterooms and based on usual rates. 4-to-Go from $1088: Applicable to minimum 2 twin-share Promenade or interior with virtual balcony staterooms booked. Stated price is based on Oct 15 departure and rates differ across all promotional dates. 3rd & 4th Guests Cruise FREE: Up to 2 guests cruise free when sharing a stateroom with 2 full-playing guests. Applies to interior stateroom category 3V to Balcony stateroom category 38 only. All above promotions apply to selected departure dates for Voyager of the Seas round trip Singapore departures, are not combinable and valid for new bookings made till Aug 19 only. Next: AirAsia: Save Up to 45% on Flights when You Book More Tickets!